Discover your favorite teapot by taking a journey through Seagrove. Enjoy a tea tasting experience at Blue Hen Pottery, Dean and Martin, Eck McCanless, From the Ground Up, Red Hare Pottery and Thomas Pottery. Southern Tradition has always been iced tea. 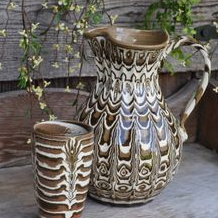 Featured pottery for this event is pitchers and tumbelers. Enjoy tea tasting experience at Blue Hen Pottery, Dean and Martin, Eck McCanless, From the Ground Up, Red Hare Pottery and Thomas Pottery. an experience you can't get anywhere else. Come spend the day with us.